Because all Asian food is pretty much the same, right? And no, this is not some trendy fusion restaurant. Out of curiousity, I tried one once. It was a bland, fast food type of cuisine that amounted to soggy vegetables and meat bathed in either soy or teriyaki sauce. Nothing like the widely varied and often spicy dishes that could be offered from any of these countries. For a country so renowned for its food, France has a lot to learn about the cuisine offered outside its own borders! Then there was the beachside restaurant in a small Cote d’Azur village where I’m pretty sure they weren’t really serving “wolf” and where I decided to avoid the “crusty of salmon” altogether. Here, in the U.S., we find plenty of mistakes. There’s the most obvious: the use of the word “entrée.” It means the first course, entering the meal if you will. But in the U.S. we almost always use it for the list of main dishes. Then there’s a restaurant near us called “La Café.” Decent food, but my husband gets a nervous tick every time we pass it because “café” is masculine, so it should be “Le Café.” Gender mistakes don’t bother Americans much because we don’t use them. But imagine the irritation that those of us grammar lovers experience when someone uses a double negative: “I don’t have no bread,” and you can see how my husband must feel. It can be a challenge, trying to order a croissant or any other French food here. My tongue wants to use the French pronunciation, but then I get looked at either in confusion, or I get a big eye roll because clearly, I’m being pretentious. Using the American pronunciation ensures that I will be understood, but it’s like fingernails on a chalkboard to me. 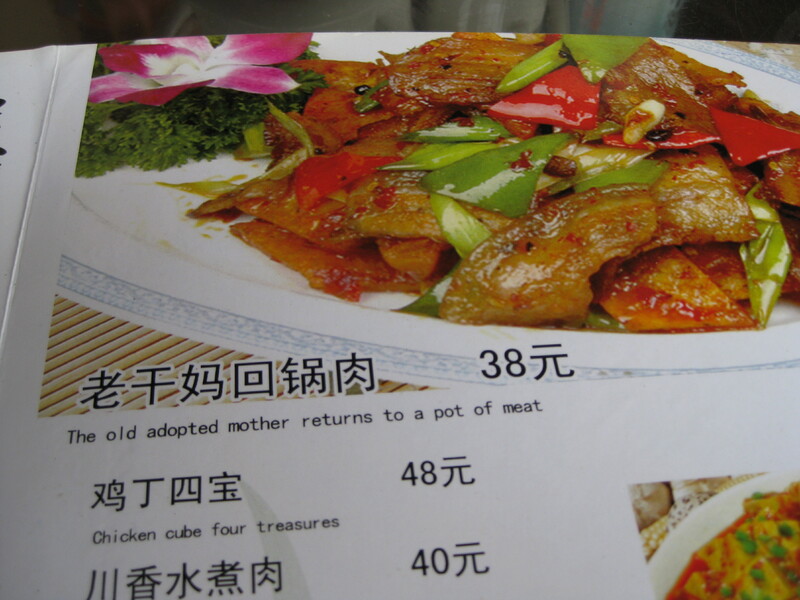 I’d love other examples people have experienced with menu items that got lost in translation. Bring them on! This entry was posted in American Food, Bilingual, Food, France, French Food, Traveling and tagged Americans, food, France, French, French Language, french pronunciation, Languages, Lost in Translation, Translation, Traveling by A French American Life. Bookmark the permalink. Ouch. At least s/he was trying French! Did the French person understand? There are so many reasons why I love this post! 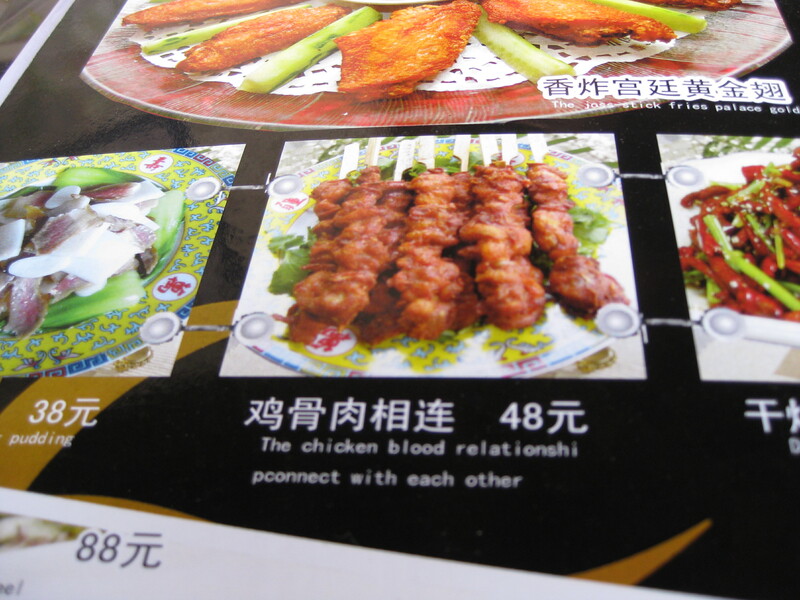 The chicken blood relationship connect with each other is #1, but coming in a close #2 is your French husband’s irritation with “La Café”. Here in St. Louis there used to be a really good French restaurant in a very posh area. 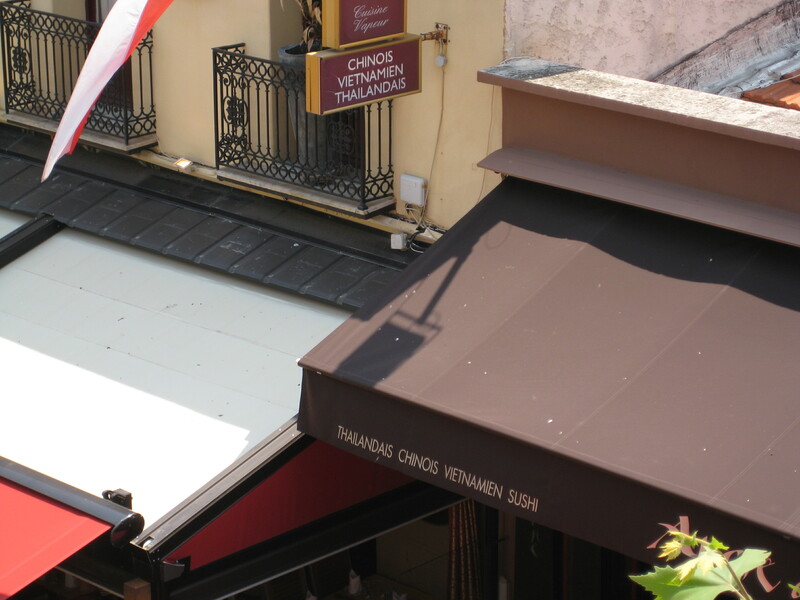 The only problem is that it was called “Café Provençale”, that’s right, with an “e” on the end of “Provençal”. It really drove my husband nuts. Once, when we’d become regular customers, we were there chatting with the owner and enjoying the digestif he’d so graciously offered to us (à la française). This was his chance. My husband told him about the “e”. The owner was horrified, and within a week the “e” had disappeared. I can’t think of any funny menu mistakes, but I do remember a French waiter once asking me if I wanted my steak bloody (hehe). Gotta love that bloody steak! Good for your husband for having the courage to speak up! We said something to the owners of La Café, they shrugged. In their defense, it isn’t a French restaurant, it’s actually a kosher restaurant serving middle eastern, american, italian, and mexican fare. 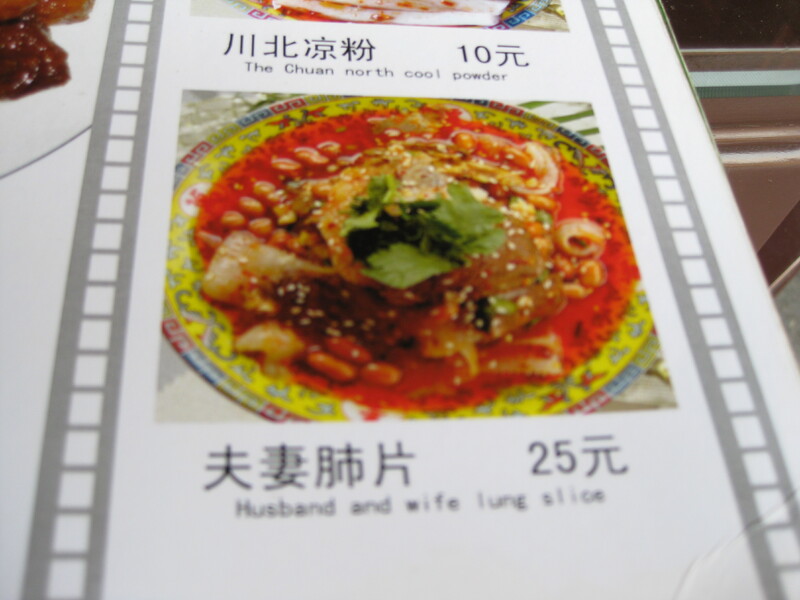 With a menu like that, why not mix genders, too! It’s not easy to translate…. It’s a real job. I make mistakes (myself?) so I don’t blame people. By the way, my greatest experiences were definitely in Asia. indeed translation and pronounciation are big here in my France, not so much with tourists but those who live here need to be perfect or else. One learn with time, and still a chuckle of the tourist trying their French here and then running back and saying “Oh I spoked French and they undertood me” and the French waiter winkling an eye on me next table hehehe they got you! Nice funny post. I knew it! You guys laugh at us! 🙂 We’re trying, really. French is hard! I speak bad french all the time… I’m sure with an atrocious accent, but the lovely Provençals don’t mind at all. and we, too, suffer the disappointment of French “Chinese” regularly. There is a fashion for using apostrophes on the names of shops here in Brazil but unfortunately they are nearly always used incorrectly even when the owner has obviously spent a fortune on designing everything about the shop. I wince every time I see one and tut to myself if I have to go in. I know that British people also have problems with apostrophes but it seems less of a problem to my inner grammar nazi when I am at home: I just assume it is a lack of knowledge and not just trying to be chic. Yes, punctuation and accents often get lost in translation! These are easier to let slide, because like you said – it’s likely to be a lack of knowledge as they can be harder to get right.